Thunder Bay Press, 9781626860667, 48pp. Almost as fun as tracing a route on a map, you can create stylish, sophisticated artwork of your favorite travel destinations by connecting the dots in these unique puzzles! Satisfy your inner child and your adult intellect all at once. This timeless activity is now revolutionized to create twenty pieces of fantastic, stylish line art you’ll want to remove and display when you’re finished. Tonal shading and detailed line work build as each numbered section is finished. Dot-to-dot puzzles have also been proven to increase short-term cognitive acuity, hand-eye coordination, and concentration skills. 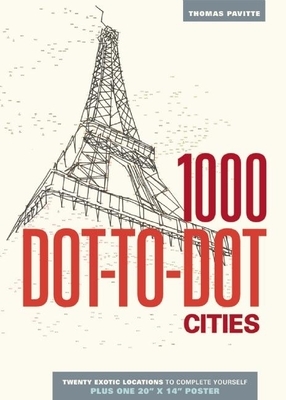 Whether you’re filling time on a rainy day, using the puzzles for a party game, or learning the principles of drawing, 1000 Dot-to-Dot: Cities is fun for all ages. Get your pencils ready and connect the dots! Graphic designer and experimental artist Thomas Pavitte uses simple techniques to create highly complex pieces. He set an unofficial record for the most complex dot-to-dot drawing with his 6,239-dot version of the Mona Lisa. He lives in Melbourne, Australia.